The TD Banknorth 250 at Oxford Plains Speedway is known as the richest one-day short track race in America. There is an automatic $25,000 going to the winner plus $100 for every lap led. One of the things that makes the race unique is that unlike other great events like Florida Speedweeks, the All American 400 or the Snowball Derby, all of the Oxford heat races, consolation events and 250 green flag race laps will take place on one day – Sunday, July 31st. But even if the racing action only takes place on one day, that doesn’t mean that Speed51.com will only be covering the race on Sunday. The popular short track website will feature full coverage of the event for the next week. We will have previews, practice updates from Friday and Saturday, coverage of Saturday night’s ACT race and plenty of photos at the track all before a race lap is run in the 250. In fact, Twist’s biggest racing memory comes from the 250. 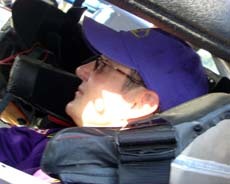 Speed51.com has become a leader in online Motorsports information by focusing on the Short Track Racing realm. 51 realized nearly five years ago that there was a void in the industry for news and behind-the-scenes stories. Now, 51 is viewed by thousands of fans per day. The site fuels your Short Track appetite for NASCAR's Grand National and Elite Divisions, NASCAR Modifieds Tours, the USAR Pro Cup Series, Super Late Models from all across the country and much more. Dillner has also got acquainted with the Oxford track. He competed there in a match race against PASS Champion Johnny Clark last week. And with an off weekend on the NASCAR Nextel Cup schedule, Kyle Busch and Matt Kenseth might not be the only ones spending their Sunday in Maine. Dillner himself could pop up there if a ride can be found from his North Carolina home. Kurt Busch won't be at this year's 250, but his little borther will. 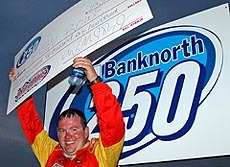 Ben Rowe knows all about the TD Banknorth 250 - he's won it the last two years. Johnny Clark is one of the favroite for this year's race. 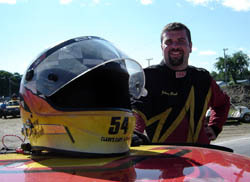 51 Sports, publisher of Speed51.com, is continually signing up clients for its Sports Services and Web Design work for 2005 and beyond. 51 offers everything from single-time press releases to full campaigns, website development and much more. If you are interested in finding out more, please contact us at www.speed51.com or through Jeremy Troiano at (704) 726-6849. The TD Banknorth 250 is an event that Twist has a deep history with and appreciation for. He grew up as a race fan in New England looking forward to the 250 every year and still does despite having a schedule that takes him to racetracks across the country.